Meet the Bird Man. 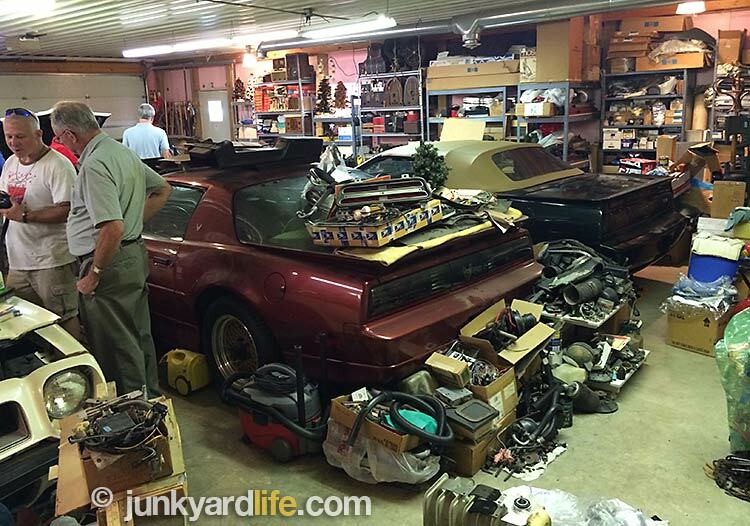 Indiana’s Steve Hamilton owns the world’s largest, running, Pontiac Firebird Trans Am collection. 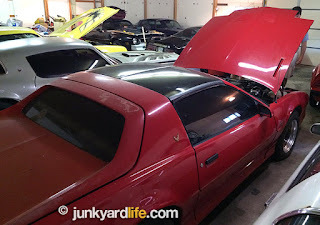 The semi-retired electrician is not an automotive speculator, he just likes Firebirds. Hamilton bought his first Firebird in 1969. He liked the style, size, and the way the car handled. The next 100-or-so Firebirds and Trans Ams just happened. Hamilton’s automotive passion combined, with shrewd purchases made during several decades of car hunting, gave birth to a collection of some of the most prized Pontiacs ever built. Arrowhead emblem enthusiasts know that a Super Duty, or First-Gen Trans Am is a rare bird. Hamilton bought them in multiples, when their values were low. He was not content to stick with one generation of Firebird. 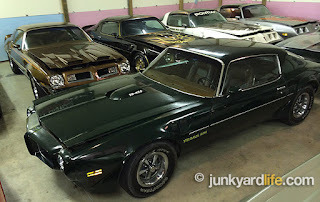 All four generations of Firebird, from its debut in 1967 through the end of the model’s production in 2002, are represented. 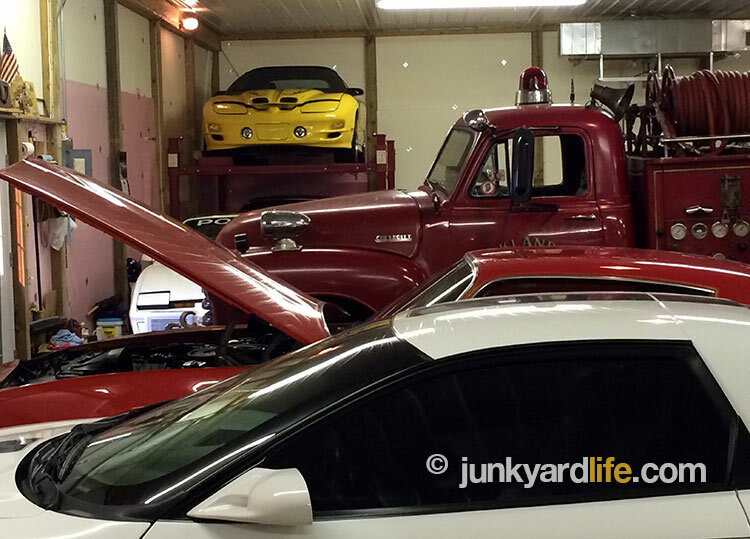 Follow along as we see the collection and meet the man behind the wheel. 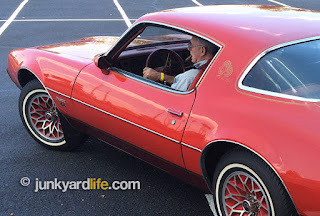 Hamilton wheels his 1979 Pontiac Redbird to a car show in Louisville. 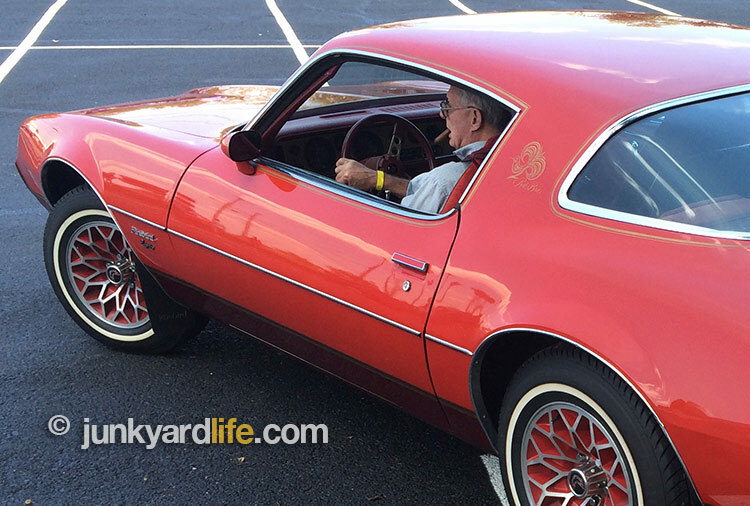 Steve Hamilton arrived at the Louisville Expo Center driving a 4-speed 1979 Firebird “Redbird” edition. Windows down, armed with his signature cigar, he had the look of a man who has been to more than his share of these Pontiac rodeos. Hamilton pulled his all-original, console-delete Redbird into the giant building for the annual POCI convention. Although, the understated Redbird was the only one of its kind at the Pontiac-Oakland show, it hardly suggested that the 70-year-old owner was the titleholder to the largest, running, Trans Am collection in the world. 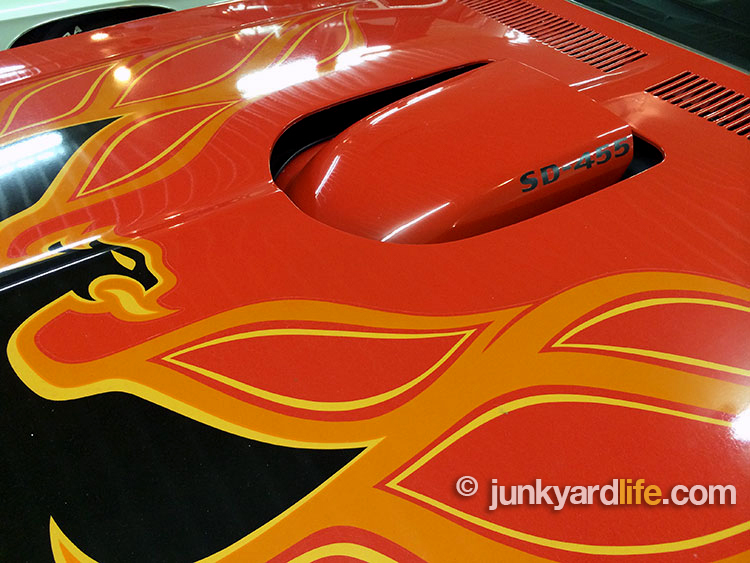 Lucky for us, we knew that where there’s smoke, there’s Firebirds. The wheels were in motion for Junkyard Life, with help from fellow ’Bird lover, Scott Scheel, to visit Hamilton’s ultimate Trans Am show in Indiana. Let’s go! 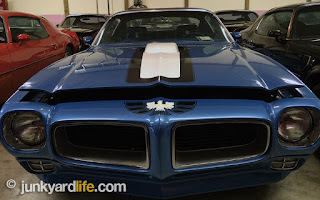 All generations of Pontiac’s Firebirds are represented in Hamilton’s collection. 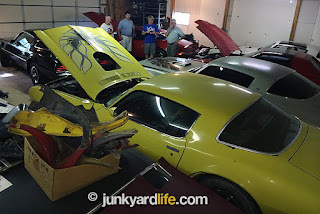 A flock of Second Generation (1970-1981 models) surround a super rare 1969 Trans Am convertible. 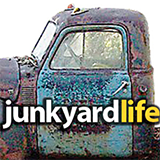 Junkyard Life hit the highway northbound to a cornfield in Indiana. Hamilton’s huge stash of fine feathered Birds will forever be our Firebird ‘Field of Dreams’ moment. Eighty Firebirds/Trans Ams. Housed in four buildings. All surrounded by corn. The doors swung open to Hamilton’s “Bird’s nests” and a flock of time capsules sat before us. Hamilton, a gracious host after a long day and a 100-plus mile road trip, guided us on a first-class tour and answered hours of questions about Trans Ams and collecting. Where to begin? There were nine Super Duty T/As. Nine! Nine of the most sought-after, and valuable Trans Ams in existence. That’s not to say we scoffed at Hamilton’s three first-year 1969 Trans Ams coupes. Did we mention there was a ’69 T/A convertible clone in the mix, too? Restored to perfection in 1985 with correct T/A parts. We were blown away! So much to see. Every inch of the buildings were packed with cars and parts. 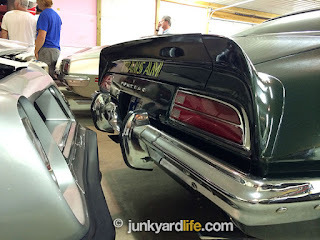 There were Trans Ams in every color imaginable, Anniversary Editions on racks, a one-of-146 Brewster Green ’73 T/A. A one-of-17, 6-speed, solid roof (non t-top) 1994 25th Anniversary T/A. Bandit car, yes! Don’t trip over that 4-speed W50 Formula in Goldenrod Yellow. We didn’t want to miss anything. It was overload! Super Duty optioned 1974 Pontiac Trans Am in Buccaneer Red. Hamilton bought most of his collection when the market was ripe and used Birds were plentiful. During those decades, old Trans Ams were just viewed as used cars. Nobody wanted the early models. It’s just the opposite now. Those low-production 1969-1973 Trans Ams get all the attention, and command a premium when a new owner takes the keys. That wasn’t chump change, but Hamilton selected wisely, and built his collection on quality. 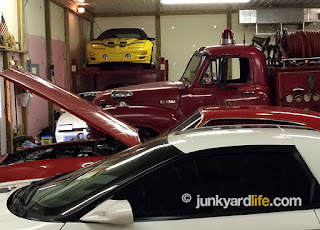 Not junky cars. Some have been restored, but many remain complete and factory original. Word soon spread to would-be sellers that Hamilton was the man to see if you had an old Firebird Trans Am. That meant many beat-on, and banged-up T/As with Keystone mags, fat tires, and louvers over their rear window also landed at Hamilton’s doorstep. Intent on keeping the desirable ones, he culled the junk to make room and funds for restorations and better purchases. The collection grew. 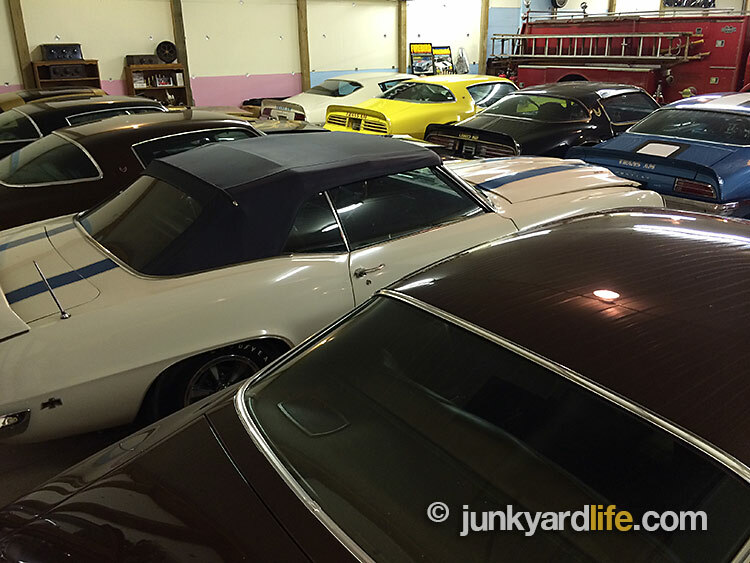 So many treasured Pontiacs under one roof. A silver 10th Anniversary Trans Am may get overlooked next to a 1976 Formula in Goldenrod Yellow paint with a 4-speed. Hamilton claims 80 of his cars are “runners” worthy of being listed as part of his car collection. His definition of a “runner” means that the car is drive-able and presentable at your local car show. Not a pile of junk. 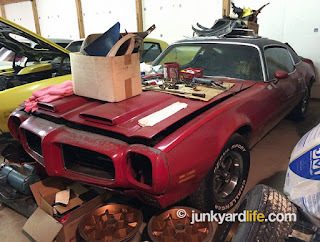 Others may claim to have a larger collection of Trans Ams, but are they rust buckets, parts cars, and fields full of junk? Hamilton does not count the dozens of parts cars, non-running projects, and hulls that he owns as part of his collection. Hamilton’s project cars are not considered part of his collection. 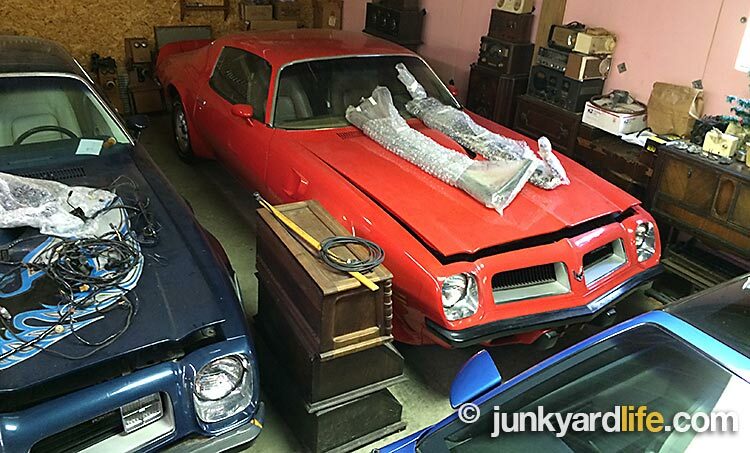 A total of more than 100 Firebirds and Trans Ams could be counted on the property. 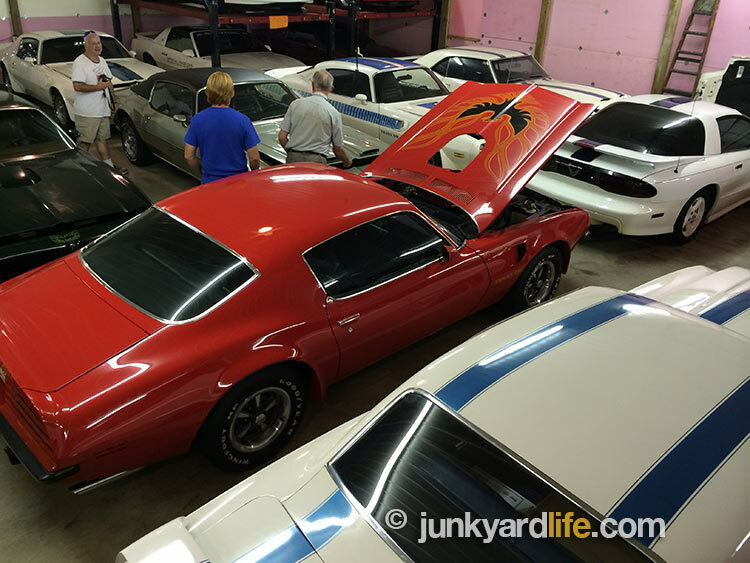 1969 Pontiac Trans Ams are rare, unless you are a visitor to Steve Hamilton’s collection. Rounding up a list of the rarest of the rare in Hamilton’s collection is no easy task. He owns multiples of Pontiac’s first Trans Am - the iconic 1969 model, of which, only 697 were built (8 convertibles, 689 coupes). 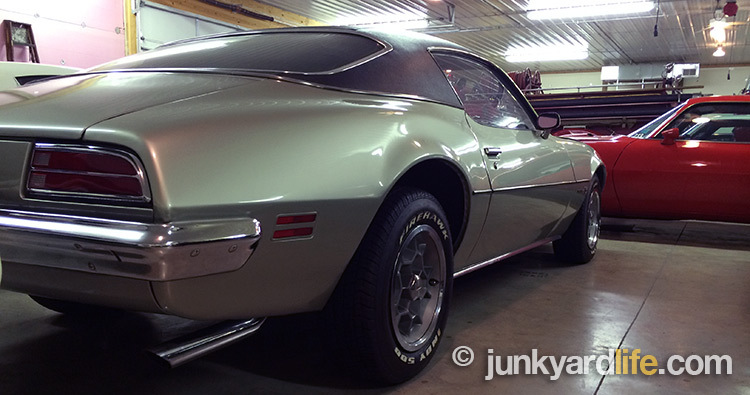 Three complete 1969 Trans Am coupes would give pause to any Firebird fan. 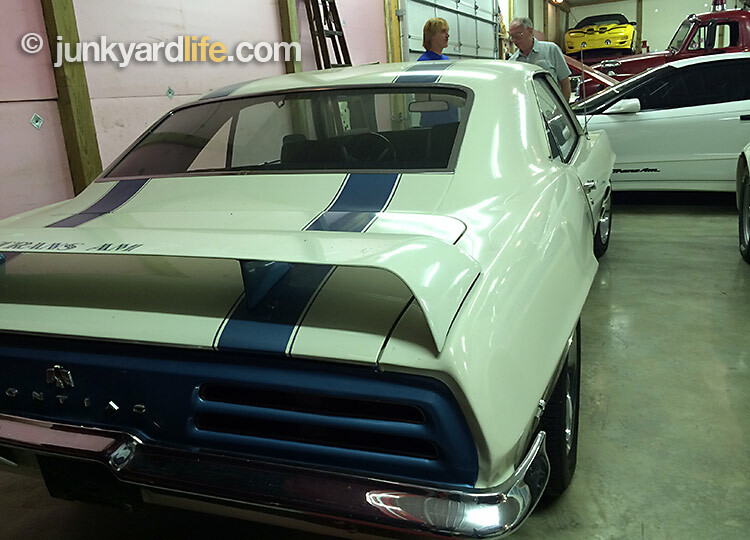 A fourth ’69 T/A coupe (Ram Air III, 4-speed) is now undergoing restoration. Hamilton was quick to note that his 1969 Trans Am convertible “clone” was built in 1985 using correct Trans Am parts. The drop top gets driven often and causes whiplash at car shows. “I figured that I would never own one of the original eight, so I built one,” said Hamilton. Nine Super Duty Trans Ams equipped with Pontiac’s fire-breathing 455-cubic-inch engine are also part of the collection. Some would say these valuable ’Birds are the collection. Only 1,296 Super Duty-equipped Trans Ams and Formulas were built during the 1973-1974 model years. With a scant 353 built in 1973, and 943 produced in 1974. I had never seen one of Pontiac’s race-bred engines in a Second Gen, let alone nine, before visiting Hamilton’s collection. The Super Duty was built using many forged internals, free-flowing heads, and a beefy, reinforced, 4-bolt main block. A high-pressure oil pump (80-psi) and a baffled oil pan also provided plenty of lubrication inside the race-ready SD-455s. These under-rated, torque monsters (rated at 290hp at 4,000 RPM and 395-ft-lbs at 3,600 RPM) were capable of making more than 500hp with a few modifications. Pontiac’s flagship engine forged a potent reputation that pays big dividends when a pristine Super Duty crosses the auction block. Note: A limited number of Formula SD-455 were produced — 43 in 1973; 57 in 1974. Each SD-455 Formula was equipped with a Trans Am shaker set-up. 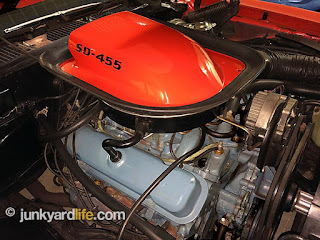 Pontiac, still beating the drum for the all-but-extinct muscle car, developed their Super Duty 455 engine despite compromised compression ratios, gas wars, and ballooning insurance premiums. 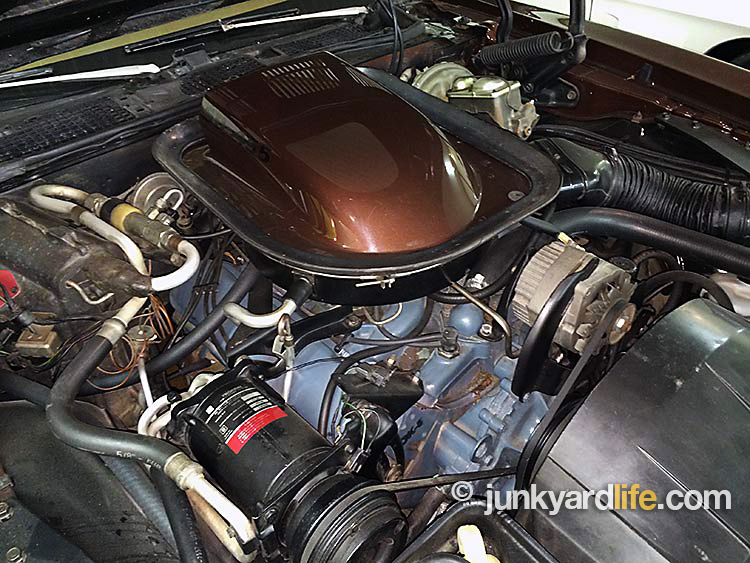 The detuned engine was the closest thing to the glory days of the muscle car. 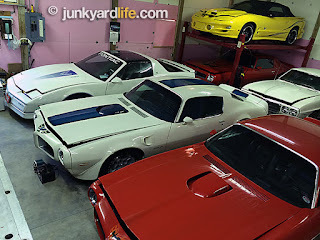 As we stood in one of Hamilton’s four “Bird’s Nest” buildings, we asked him to name his favorite Trans Am. “I like the round headlight cars,” Hamilton said, referring to the 1976 and older models. A quick survey of the collection and you will discover his favorite year of the round headlight ’Birds – 1976. Every paint color offered on 1976 Firebird Trans Ams can be found in Hamilton’s collection. 1973 Super Duty Formula in Brewster Green. A collection of Trans Ams all painted the same color would be boring to some. Hamilton does not disappoint. He owns a Trans Am in each of the six colors offered by Pontiac in 1976. (Cameo White, Sterling Silver, Starlight Black, Firethorn Red, Goldenrod Yellow, and Carousel Red, which is actually a shade of orange.) Along with eight 1975 T/As, six 1974 models, covering each of the three paint options offered (Cameo White, Admirality Blue, and Buccaneer Red). All three 1973 Trans Am colors are accounted for, too (Cameo White, Brewster Green, and Buccaneer Red). Based on numbers alone, Hamilton attempted to complete his collection by covering the color palette of all the early Trans Ams. 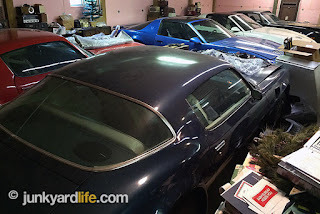 If I counted correctly, Hamilton owns 29 Firebirds/Trans Ams covering 1973 through the 1976 models. That’s just over 36 percent of the 80 total “runners” in the collection. The first-year Trans Am, a 1969 model, was only available in Cameo White. From 1970 until 1972, Trans Ams were offered in Cameo White or Lucerne Blue. Owning all factor color combos was easy until Pontiac started to expand their exterior colors options. 1969 Trans Ams featured painted stripes in Tyrol Blue. 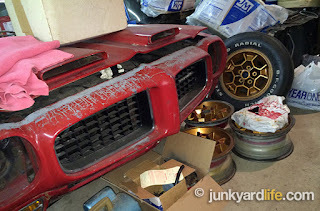 Hamilton has collected a few parts during the last 40 years. Ron Kidd has a few questions for Steve Hamilton. In 1985, Hamilton attended the first Trans Am Nationals in his 1969 Pontiac Trans Am. 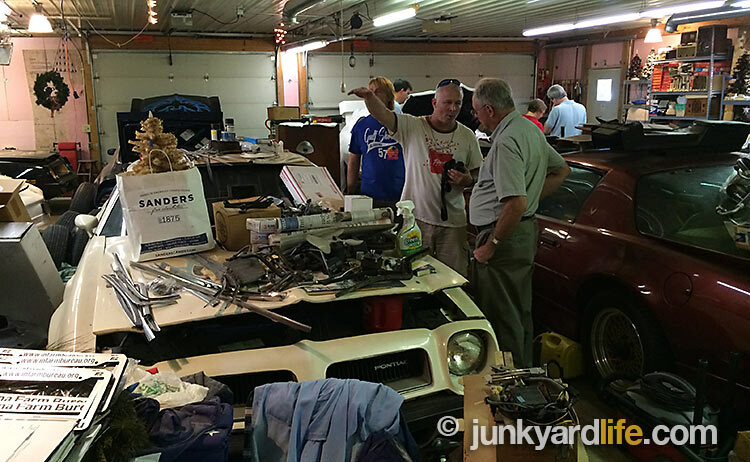 That same car has been to every Trans Am Nationals since – an astounding 31 consecutive years. Hamilton’s first-year Trans Am (1-of-697 built) was the only ’69 T/A to attend during the show’s first few years at the Dayton Airport Hotel in Ohio. Each year, more of Hamilton’s cars have appeared in the show as his collection grew. Transporting multiple cars (as many as nine) can be a challenge. Oftentimes, Hamilton has relied on eager members of the Indy Firebird Club to ferry the cars to Ohio, or he secures a car hauler to deliver a few of his revered Ponchos to the T/A Nats. 1973 Firebird Formula in Ascot Silver with black vinyl top. Hamilton believes that his collection should be driven and enjoyed. After a recent trip to a weekend-long car show in Indianapolis, Hamilton faced a dilemma. 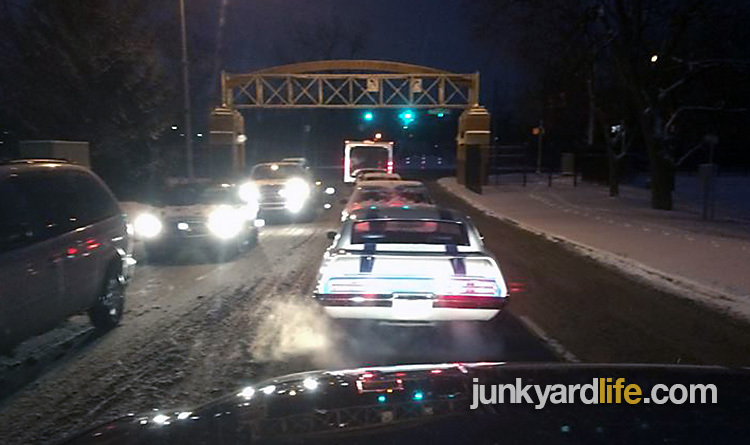 Should he drive one of his prized 1969 Trans Ams home in three-inches of snow? The unexpected snowstorm had surprised the contingent of car owners. Making wimps out of many owners – not Hamilton. He drove the ’69 T/A home, undaunted by salt and snow. Nothing a careful driver, good bath, and detailing couldn’t handle. Driving a rare 1969 Pontiac Trans Am in 3 inches of snow. Hamilton steered the 1969 Trans Am home safely. Hood up on this Lucerne Blue Trans Am for easy battery access. Maintaining a fleet of 80 ’Birds requires continual attention. Hamilton’s collection has been featured in High Performance Pontiac and Pontiac Enthusiast magazines. GM and the Pontiac Motor Division also provided a publication to new buyers in 2001 that included a feature story on Hamilton’s collection. Sharing the collection with like-minded enthusiasts has always been part of Hamilton’s plan. 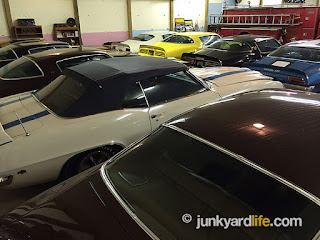 As the hospitable host to hundreds of guided tours, Hamilton and his collection have become a legend in the Pontiac world. His blue collar blueprint shows that the average guy, without deep pockets, can build a garage full of dream cars purely on dedication and determination. 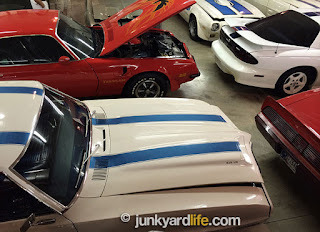 A Trans Am museum is the next logical step. Hamilton has bounced that idea around, but that may not happen until he increases the size of the buildings currently storing his collection. In the meantime, this full-time Trans Am collector has no intentions of slowing down. 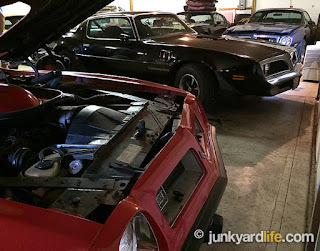 My visit to Hamilton’s, and exploring the 35-year evolution of the Pontiac Firebird was a treat for this Firebird-Trans Am fan. I can’t wait to go back! 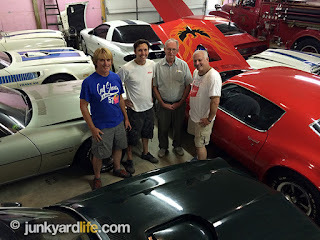 Anthony Powell, Jody Potter, and Ron Kidd with Steve Hamilton in the midst of the world’s largest, running, Firebird-Trans Am collection. Do you drive them all? “Hate to say it, but it’s the V6. 1989 Anniversary turbo car is tops,” said Hamilton. A notch back optioned 1988 GTA in red. 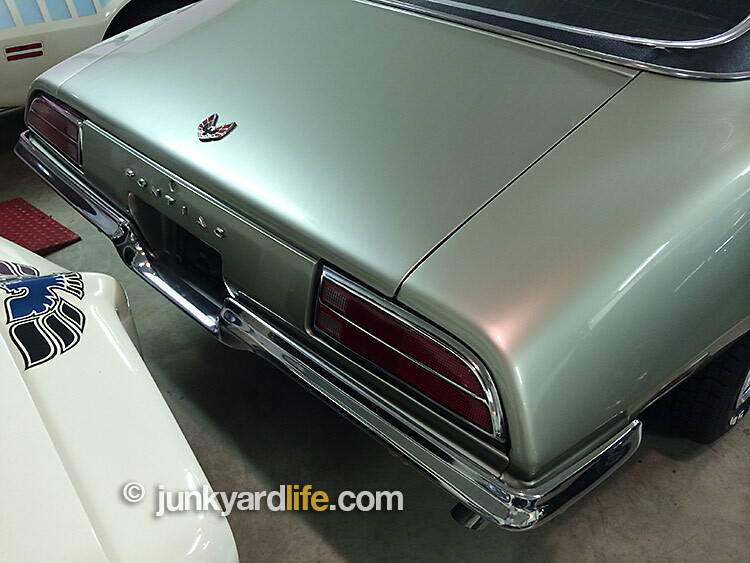 This silver 1973 Formula will make you forget about the optional trunk spoiler. The lines are striking. Hamilton has enough parts to build plenty more ’Birds. 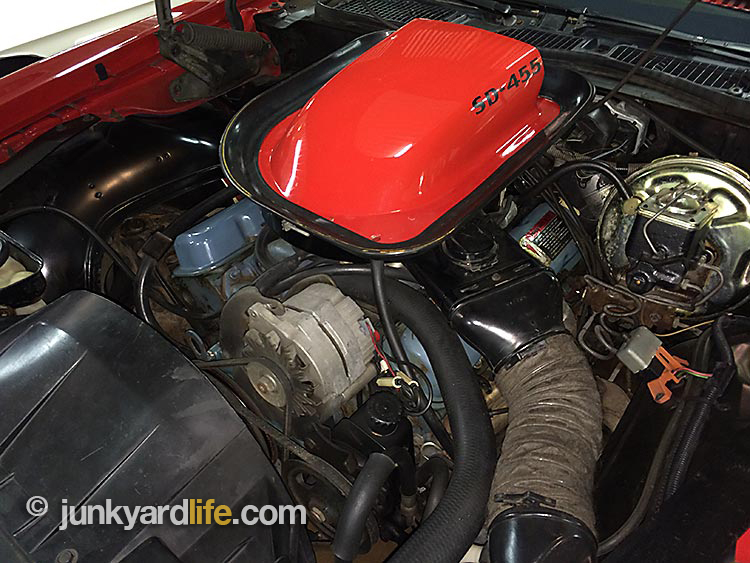 Steve Hamilton has cornered the market on 1970-1981 Pontiac Trans Ams. How many do you have? 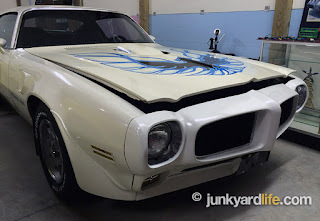 1973 Trans Am in Cameo White — the first year for the John Schinella designed giant hood bird decal. Crestwood Brown Super Duty 455 Firebird Formula, 1-of-57 1974 SD Formulas. Buccaneer Red 1973 Formula with a stack of honeycombs wheels. 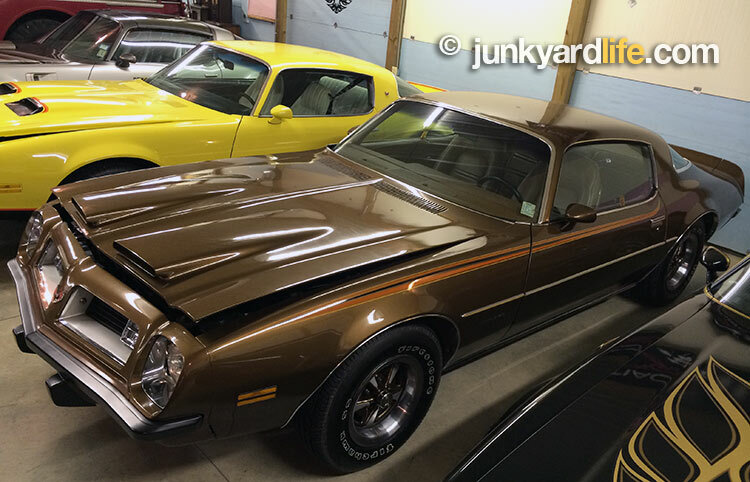 Hamilton bought a black 1977 Bandit Trans Am in 1977 after watching Burt play the "Bandit.” It was a repo bargain. Hard to find, Brewster Green 1973 Formula Super Duty 455 in close quarters. Hood up detail photo of Pontiac’s Super Duty 455 engine. Just another 1974 Super Duty Trans Am. A Ginger Brown 1975 Firebird Formula with stripe. 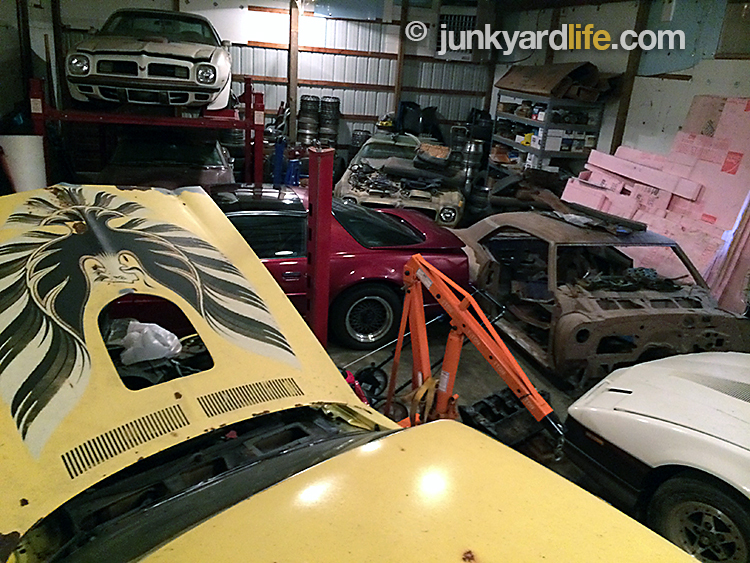 Hamilton looks over a few Trans Ams and one that serves as a storage shelf for extra parts. Trans Ams are packed like sardines in one of Hamilton’s buildings. Third Gen 1988 Trans Am GTA notchback. Several original, but worn, vintage project Firebirds are waiting for restoration in Hamilton’s shop. 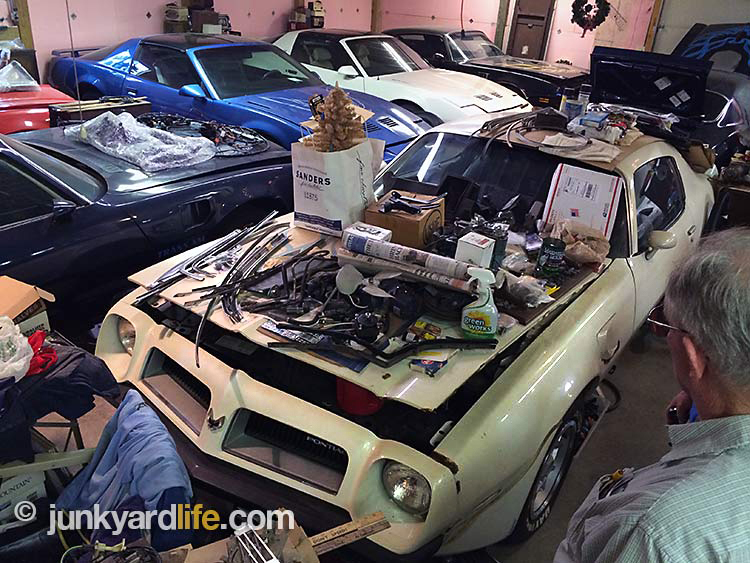 A 2002 Collector Edition Trans Am convertible is perched above thirty-or-so ’Birds. Just beyond the solid roof 1994 25th Anniversary T/A sits the vintage firetruck that divided the Firebirds in Hamilton’s main building. 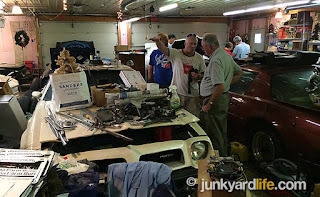 Know an interesting car collector or about a junkyard that we need to visit? Tips for our projects?